When is this thing gonna end? My friends... My family... My co-workers... They're all asking this same question. I'm sure you've asked it yourself over the past few months as well. Everyone wants to know, when will this bull market end? Have we seen a top in stocks yet? Usually when a bull market ends, we see a "blow-off top" moment. My colleague Steve Sjuggerud calls this the "Melt Up." This happens when investors pile into stocks and push prices extremely high in a short period of time. In other words, toward the end of a bull market, investors who may not have participated in the rise of stocks suddenly do not want to miss out on the "easy gains" anymore. Typically, tech stocks benefit the most in a blow-off top market. So far, we haven't seen this ramp up in earnest. Sure, tech stocks have been profitable, but not absurdly profitable. Tech stocks, as measured by the Technology Select Sector SPDR Fund (XLK), are up about 15% year-to-date (including dividends). That's a great return. But not a typical blow-the-top-off return. 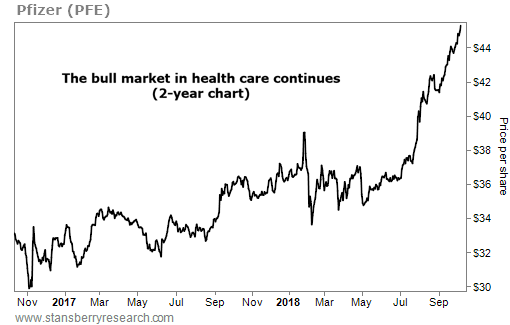 Over the past 18 bull markets – as far back as we have data – the average return of the S&P 500 Index over the final six months of the bull market is about 20%. Now, these aren't the tech-heavy stocks that can really take off in a Melt Up. But folks always want to buy high, and the S&P 500 gaining 20% in the late months of a bull market is proof. Most of these are textbook blow-off top returns. 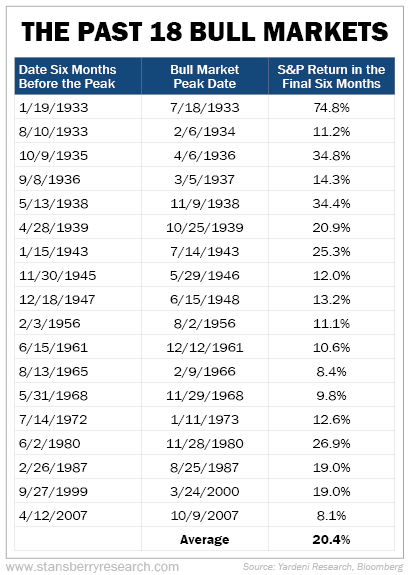 A 10% gain over the past six months is nowhere close to the average return of 20% over previous bull markets' final months. Back in January when the market peaked at 2,872 points, the S&P tacked on 16% in the final six months. That's normal end-of-bull-market behavior. Now, the S&P is back above January's peak. And we still haven't seen the major run-up that we'd expect before the top of the market. Think back a few months ago to when all anyone would talk about was bitcoin. My research staff had friends who knew nothing about investing or finance asking them if they should buy bitcoin. That's what a top feels like. It doesn't feel like everyone is rushing to their brokers to buy stocks right now. With a booming economy and earnings coming in at all-time highs, investors should be hitting their buy buttons. Don't be surprised to see a late-stage run-up in stocks in the next few months. On Wednesday, October 24, Steve will sit down with some of the biggest names in finance – in front of a live studio audience – to discuss how to capture the upside of the final stage of the Melt Up... before the eventual "Melt Down." This will be the only time he reveals a recommendation on air with the potential to return 1,000%. Save your seat by clicking here. "Ordinary Americans realize the economy is doing well," Brett Eversole writes. "They're as excited about today's prospects as any time in recent years." Learn more about why this means the market can still move higher right here: Consumer Confidence Hits an 18-Year High. Like Doc says, investors should be taking advantage of the Melt Up today. Recently, he shared one simple way investors can pick winning stocks – in any market environment. Read more here. Pfizer (PFE) has multiple blockbuster brands, including its cholesterol drug Lipitor and pain reliever Advil. It also sells many of the drugs most often prescribed to Medicare patients, like Norvasc (for high blood pressure), Zoloft (for depression), and Glucotrol (for diabetes). Not only do these drugs help people, but they’re also great for profits… In the most recent quarter, Pfizer reported adjusted earnings per share of $0.81, up 21% year over year.